Shield Glass The C128 is a the most popular selfserve sneeze guard. The shield is 12" deep and is held at a 45° angle to the floor. The front edge of the sneeze guard is 13" off the counter. There is a top shelf of 8" or 12" deep. 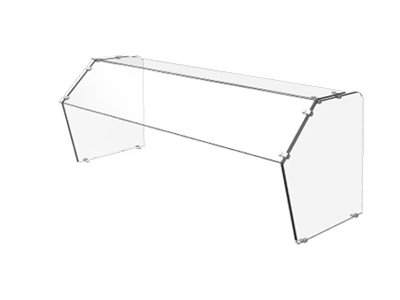 The shield is 1/4"clear safety glass for 24" to 42" wide unless it is upgraded to 3/8" crystal clear glass. On shield bigger tha 42" up to 60" the shield is automaticly 3/8" glass. 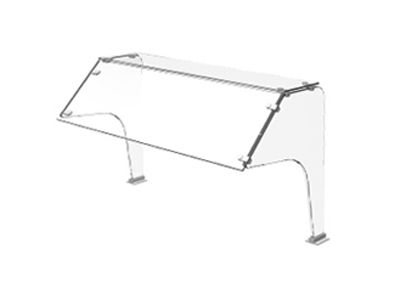 Bay Size The standard sizes for the C128 sneeze guard are from 24" up to 84" in 6" increments. The distance between supports greater than 60" an internal glass support truss is required. Standard vs. Custom Standard units usually ship within 48 hours, where custom size units require 7-10 days to ship. We stock the glass for bay sizes 24" to 84" in 6" steps. That is 24", 30", 36". . . . 78",84" are stock sizes. It not only takes longer for a custom size we also charge a 20% premium. Orders which have a truss take 7-10 days. Corners Standard units have square corners on the shield and top shelf. Rounded corners (1" radius) are available as an upgrade and are considered a custom order even if it is on a standard size unit. Supports The C128 has five support options made from Clear or Crystal Clear Safety Tempered glass. The Front, Open and Sculptured supports each have a 2"x 3" attachment footprint. These three supports are design to straddle food wells The Front support is attached at the front edge of the sneeze guard. The Open support is centered under the shield, and the sculptured boot attachement is 18" back from the front edge of the sneeze guard. A NSF approved sneeze guard requires either the Deep or the Extended supports on the ends of the unit. C128A Curved The C128A is identical to the C128 except it had specialized hardware which allows the front shield to be at an angle other than 180° . This allows both inside and outside curved units. These units require custom tempered glass and generally require 2-3 weeks for manufacturing. Shipping We ship using UPS Freight, and UPS Parcel. Our shipping volume gives us a 85% discount with UPS Freight. Shipments to the West Coast typically have a ship time of 1-2 days, while the East Coast takes 3-4 days.